The proposed changes could appear in sixth-to-tenth grade textbooks, and begin as early as next year. Many believe implementing those changes would further alienate Indian youth from the history of their native country. At its core, there seems to be at least three separate views on how to depict & accurately teach California sixth graders about Hinduism & India. According to the Hindu American Foundation, a Hindu advocacy group, the current textbooks show Hinduism in a negative light, focussing just on the issues of ‘Caste Oppression’. They further clarify that ‘Caste’ is not part of ‘Hinduism’ rather a social construct that, while still a valid issue, doesn’t bear its roots in Hinduism. They also believe, the kids would benefit greatly from learning about other positive references to Hinduism such as Yoga & Meditation. The Hindu American Foundation has been working with the Department of Education and were making incremental progress over the years. The Uberoi Foundation for Religious studies, gathered a whole set of esteemed scholars of their own from all over the world, with equally robust credentials & experience to rebut the edits suggested by the South Asia Faculty Group. While they agreed with a few of the edits suggested, they found it troubling that the Group wanted to eliminate mention of India, almost entirely. While so far it seemed just a battle of the academics, at the hearing, several members of the Dalit Community came and spoke out both in favor & in opposition of the mentions & representations of caste. Those in favor of keeping mention of the caste oppression and its association to Hinduism, said that removing mention of it would be akin to wiping away their history. Others who spoke in opposition of the mentions of ‘untouchability’ & caste oppression had a more nuanced argument to make. The faculty group disagreed with the removal of caste mentions. Yet, they recommended the deletion of ‘Valmiki’ & ‘Vyasa’ two important figures that according to some, essentially make the argument of how ‘caste’ is a modern problem not rooted in Hinduism. Juluri’s efforts weren’t singular — numerous public awareness campaigns, including letters from other professors of religion and history, disputed the faculty group’s assertions that the framework should be edited. 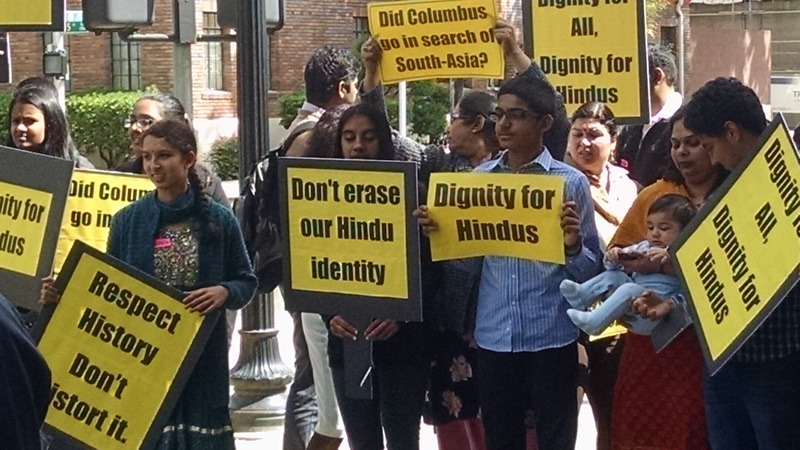 During the public comment period, the Hindu American Foundation, other Hindu organizations, community members and other non-Hindus relayed their sentiments of inaccuracies in the proposed edits and the last-minute process by which they believed the framework proposal was initially and uniformly accepted, even after prior recommendations from numerous academics were accepted. They opined, too, that the proposed edits would erase their cultural and religious histories from textbooks, and that it would be detrimental to the education of young Indian-Americans. The commission heard the outcry, and voted to reject some of the proposed changes, though its revised set of recommendations will not be published until two weeks before a May 11 State Board of Education hearing. David Barclay contributed to this article. DIEGO GARCIA, India Ocean (Diya TV) — The U.S. and Indian Navies went submarine hunting in the Indian Ocean, their first bilateral anti-submarine warfare exercise since a signing pact to work more closely together last fall. An effort by an American and British companies to help Jet Airways founder Naresh Goyal save the airline from collaspe dissolved after Etihad Airways and TPG Capital threatened to walk away themselves if Goyal was part of the deal. LOS ANGELES (Diya TV) — Way into its 2nd decade, the 17th annual Indian Film Festival of Los Angeles (IFFLA) concluded Sunday night with the zany slice-of-life film, The Odds, directed by Megha Ramaswamy. Complete with a glamorous closing night red carpet, and an awards ceremony the festival ended with an after party at the Spice Affair in Beverly Hills. IFFLA was only four days this year (compared to five days in previous years) but there was still so much to see during that time. In addition to the curated set of films, there was an incredible panel discussion, Breaking in Brown: Making it to Series in TV’s Golden Age, that featured panelists working in various fields in the television industry and their struggles to rise up through the ranks in the Hollywood while being brown. This year’s film lineup boasted five world premieres, two North American premieres, two U.S. premieres and eleven Los Angeles Premieres, with films presented in nine different languages. The overall atmosphere was very relaxed even with films that tackled difficult subject matters. About fifty percent of the films were directed by women so when asked about that theme, filmmakers and staff alike hoped for a future where it will be normal to have women and men equally making films. Director Praveen Morchhale was visibly surprised as he walked up to receive his award. The film he said, was about those, “that nobody talks about and nobody treats them as a human”. Even though it was Morchhale’s first time at IFFLA, he said he felt as if he had been coming here for many years, and that it is not him winning the award but the “women in Kashmir” on whom the film is based. The Audience Award for Best Feature went to Reason, Director Anand Patwardhan received a standing ovation when he went to collect his award. On accepting his award , Patwardhan said, “Most of the time our film is getting thrown out of festivals, I wasn’t expecting this.” He went on to say this was his first time here in Los Angeles and he enjoyed every film he watched and enjoyed all the interactions he had at the festival. He added that it meant a lot for the film to be well received here and how that will hopefully impact its reception in India.